Baraka is the Arabic word for blessing (of course, it’s so much more, but you know…semantics). I feel blessed to speak darija (Moroccan dialect of Arabic) because that means that I can participate in the daily Moroccan baraka exchange. Each and every thing or action can either have baraka or not. For example, food that is purchased on an honest income, prepared with love and prayers, shared among as many people as possible is said to have baraka. Food that is bought with questionable money, or processed in an unnatural way, or consumed greedily without praise of the Creator, without sharing with or offering to those around us, is said to be devoid of baraka. The first kind of food makes you healthy, physically and spiritually, will never make you ill, will strengthen your body for doing good things, will strengthen bonds of friendship and unite hearts. The second kind will weaken you, make you anxious and leave you wanting. Our daily exchanges can have baraka. Take, for example, this exchange I had with a man who is a car guardian. This is when I get in the car to drive away. I am giving him 20 cents for his car guarding, and he’s helping me navigate out of my parking space into traffic. Me: Salam alaykom akhoya. Peace be with you my brother. Guardian: wa alaykom salam. And with you peace. Me: Allah y3awnek. God assist you. Guardian: Seeri fid Allah. Go in God’s care. And that’s it. As I type it in English it sounds so contrived, but you have to understand that in Arabic, this is actually completely natural speech. This is just how people say “hello”, “thanks a lot”, “good luck” and “have a nice day”. Every utterance is a prayer, returning the speaker to the divine, time and time again. As I drive away from the guardian I feel so incredibly thankful that this is the case, I feel a little more alive, more humbled, more compassionate. Most times when I have an exchange like this, I walk away feeling a little more light. Then there are those exchanges that feel like the person reached in, took out my heart, plain cracked it open, washed it in light, and placed it back in my chest. A heart unexpectedly broken in the best way possible. Tears flowing at the most importune of moments. And it can come from the most unlikely sources. I’d like to tell you about someone who dazzles me with light. She’s a woman who sells candy outside my son’s school. Her name is Naima (not Naima from the baking project, it’s a common name) and she is one of the more joyful, exuberant people I know. She’s got this cart that she had made, and it’s a child’s delight, full of every kind of candy and trinket. She pushes this cart to the school in the morning, noontime and afternoon school, as many as four times a day. My son is a regular customer, both because he likes candy, and because I really, really want to support her. I often stop by after dropping him off at school, just to get a little dose of Naima to start my day off right. I never know what the topic will be. So I might ask her a question, like, “how did you get started with this cart?” She’ll animatedly tell me all about how she got it made and how she started out, and then she will offer the spiritual wisdom behind it. “Honey, I’d rather make one dirham the right way than a million dirhams the wrong way!”. Or if she had a day off, she’d say “Our body has a right over us! These hands, these feet, they have their rights! They’re going to bear witness against us if we aren’t good to them”. She is smiling and animated, and has this amazing faith in God. I doubt she can read or write, but she has a deep, strong wisdom about life, the human soul and our journey. About 2 months ago, I came to the school, and I saw Naima dressed head to toe in white. I was in total shock, because this is the color of mourning in Islam. Even though I knew exactly what had happened, I couldn’t think of any other way of approaching her than to ask her “Naima, why are you wearing white?”. She answered, “the man of the house died”. This is a way of referring to her husband. I stood there in total shock, and she told me about it. She said “he wasn’t sick, so it was a total surprise. He died a wonderful death, he didn’t suffer, his body was completely at peace.” Her face is glistening with tears and at the same time she is smiling and there is that joy and light in her face. “And you know, he died during the best times”. (the first ten days of the Islamic pilgrimage month, considered to be the holiest days of the year). Then, as usual, she shares spiritual insight, “we’re all just renting space on this earth, and once the rental contract is up, we’ve got to leave.” But the words that stick with me the most are “a wonderful death”. I’m amazed that anyone would use that particular combination of words, and I love it. This woman endured the ultimate loss, the person that was closest to her, and she was completely accepting of it, and could see that it happened in best way possible. These are the fruits of a spiritual life. Since then, it’s been so strange to see Naima every day, with her white jellaba, scarf, socks and shoes, busily selling candy to a 100 screaming kids or cheerfully chatting with the mothers after morning drop-off. She’ll wear white for 4 months and 10 days, the traditional mourning period. It’s a constant reminder of death. We talk about it often, revisiting the story of her husband’s death. And every time I am awed by how real her strength and faith are. More often than not, we both end up in tears, and laughing for no other reason than that we enjoy each other’s company. Exchanges of baraka are possible anywhere, anytime, if we are open to them. If you’re not getting any love then you just have to be the one that gives it. A kind word, a smile, a sincere prayer are what soften and open hearts. The sufis say that a saint is one who reminds you of God. With him or her you experience a higher level of reality, in an instant, effortlessly. If anyone ever wonders where the women saints of Morocco are, have no doubt that they are there, making bread, raising children, pushing a candy cart around. Moroccan derija (Arabic dialect) is very rich in proverbs, adages, sayings, idioms, etc. (wait, don’t all those words mean the same thing?) Moroccan speech itself is formulaic, with specific greetings and responses exchanged depending on the situation. To a sick person you say: may there be no harm (mai koon bas), the response being: may God never show you harm (lehla iwarreek bas). Since I grew up in an American home in Morocco, I didn’t have all these “calls and responses” memorized, or internalized, till, well, last week actually. It’s very awkward to come up blank in response to one of the greetings. Shukran just doesn’t cut it. You just have to be a quick study and add these to your repertoire as you hear them. (khairul kalami ma qalla wa dalla). So now that I’ve memorized every last one of the greetings (not), I’ve moved on to proverbs. Each proverb is a thin-slice of the culture. 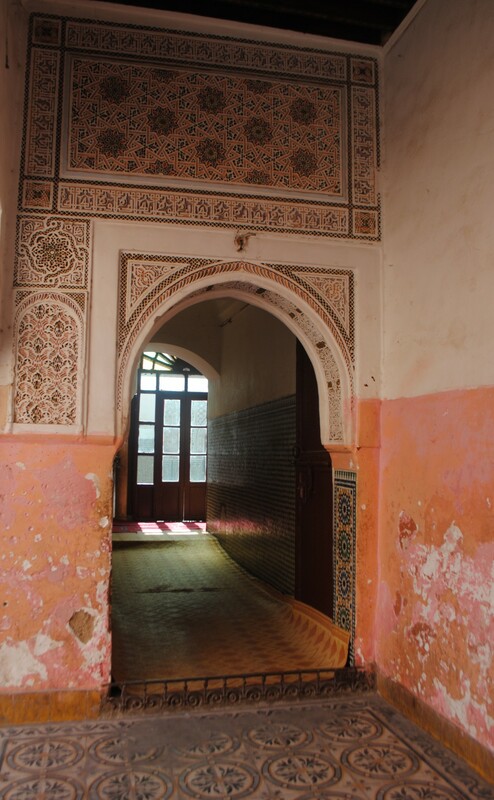 Every time I hear a new one, I learn a little something new about Morocco, a tiny intricacy. Some proverbs are funny, some are deep. In fact, those two traits characterize Moroccans and especially Marrakshis. Living here you quickly come to appreciate these two qualities. Life’s pills are swallowed with a dose of humor and a measure of grace. Of course, things like humor and widom-teachings don’t really translate, but translation brings us a step closer to some kind of understanding. So here goes. Entering the hammam is not like leaving it. dkhoul el7ammam mashi b7al khroujou. When you go into the hammam, it’s all good and dandy, but when you leave, it’s time to pay. I’d like to add, you’re a whole lot cleaner too. I’d also like to add that technically, you pay when you go into the hammam. But you get the idea. You’d be surprised at how many situations this saying is appropriate for. English equivalent: It’s time to pay the piper. The person with no cares, well, his donkey will give birth to a care. lli ma 3andou hammou, twaldou lih 7martou. For the person who can’t leave well enough alone. English equiv. : If it ain’t broke, don’t fix it. Don’t go looking for trouble, or trouble will come looking for you. One hand can’t clap. yedd wa7da makat sefaqsh. We all know this one: it takes two to tango. The neighbor, then the house. al jar thumma ddar. When choosing a home, find good neighbors first. An Islamic teaching says: take care of your neighbors and that means 40 houses in either direction! I love neighborhoods where being a good neighbor is still valued and implemented. When we lived in the old city (medina of Marrakesh), I felt like there was definitely more of that. Once when I was pregnant, I casually asked my neighbor how she makes the Moroccan pancakes beghrir. Well, me being pregnant + her being a good neighbor = she showed up with the pancakes about an hour later! This is also the same neighbor who, when I casually asked her how to cook the two free-range chickens I had just bought, didn’t hesitate for a minute. She came in, rolled up her sleeves and started washing the chickens (shudder…cleaning chicken makes you the boss of everyone in my book), then proceeded to make the most awesome chicken tajine, like it was no big deal. From then on, I “casually” asked her about lots of things! I compare you to who I see you with. M3amen sheftek, m3amen shebbehtek. It underscores the importance of keeping good company. One of the teachings of the prophet Muhammad is (my own loose translation) A person is on the same path as his or her closest friend, so consider who your closest friends are. English equivalent: Birds of a feather flock together (this is the closest I could get). The one who serves a people is their master. khadimu qawmin sayyiduhum. This saying comes from the principle that things are often concealed in their opposites. The one who is humble, who serves neither expecting nor desiring praise or benefit from others, who has a pure intention, is in reality the highest of the high. Conversely, the one who grasps at power and glory, who desires that people think highly of him or her is in reality enslaved to his or her ego. Now it’s your turn: add to this list of Moroccan proverbs, or share a proverb or saying from your own culture! Maybe it’s the fact that you’ve had every meal for the last two months at the Chawarma Snack on the corner. Maybe you are starting to look like neglect, like a kitten begging for food at a cafe. Whatever the reason, you’ve been invited by your Moroccan friend over for a meal. Moroccans love to host and feed people. It’s something they do so well, with so much grace. You never feel like they’ve put themselves to any trouble, and that is something only a gracious host can do. And here you are, the American, maybe a little overwhelmed by the kindness you are being shown. Maybe you’ve never sat down for a 3 hour lunch with your family, on a normal weekday. Then maybe you are wondering, how, oh how can I be just a little less awkward? You walk in with your shoes on, only to discover that everyone else has left theirs by the door. You offer compliments to your host, only to notice that it makes them extremely uncomfortable. No need to fear, morocco mama is here. With some heads up advice that will grant you a modicum of social acceptability. And of course, you always have your “I’m an American and I don’t know how things work” free pass, which you will invoke often and freely, as you should. 1. Do bring something. Some soda, juice or fruit are acceptable. In more old fashioned households, bring milk or cones of sugar. If there are kids in the house, bring some yogurts. Don’t bring a hot dish or salad. 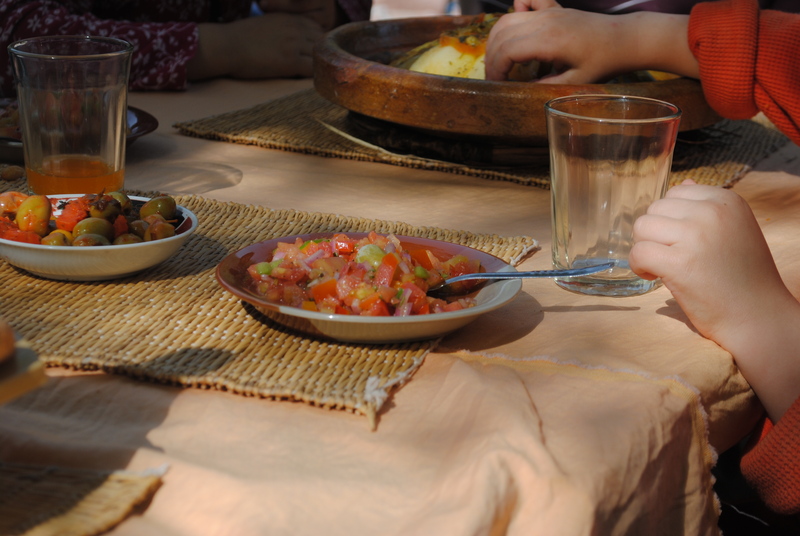 Moroccan hospitality is not “pot luck style”. 2. Don’t walk all over the carpet with your shoes on. Do wear clean socks. Don’t wage biological warfare with your sweaty foot odor once those sneakers come off. 3. Don’t say wow! Don’t gush effusively about everything and everyone in your host’s home, as in “this house is the most amazing house I’ve ever seen!”, or “wow, that’s such a cute baby!”. Chances are you are being honest and/or polite. But you are making your Moroccan hosts squirm and sweat. Moroccans do not like to receive direct praise. Do say tbarkellah! When Moroccans like something, they praise the Creator, and not the creation. Tbarkellah means “Blessed is God”. It can be used interspersed with the compliments you want to give, e.g. “You’re a good cook, tbarkellah”. (I will do a longer post on the concept of “tbarkellah” at a later date, inshallah). 4. Do learn everyone’s name. And remember it. Ask about everyone’s parents, health, children, etc. What you are saying is “I care about you and yours”. Next time you see your friend, ask about all the people you met. Don’t let the conversation get one-sided. Chances are your host will be very gracious and ask you lots of questions. Show them that you value them as much as they value you, by asking similar questions. 5. Do say bismillah. This is the blessing that Muslims say when starting anything, be it eating or any other activity. It means “in God’s name”, and it’s a way of saying that one is doing the thing “for God, by God’s will, and, hopefully, with God’s blessing”. And when you’re done eating, say “alhamdulillah”. That means “all praise is God’s”, and that marks the end of whatever it is you’re doing. Don’t wander. You will be eating from one plate, however, stick to your territory, don’t go exploring. 6. Don’t hog the meat. Your host will honor you by serving you as much meat as she can afford to. This can range from a few bites to a whole sheep, depending on her budget. Look around and see how many people are at the table, then check out the meat, and do the math. Start in slow, for the first few bites, just dip little bits of bread in the sauce. If there are veggies, move on to those. After a good 5 minutes, then you can make your move on the meat. Your host will make sure you do. If you refuse the meat, then you are saying “I think you’re so poor that I don’t want to eat your family’s meat” and that’s insulting. However, you don’t want to consume meat so fast that your host feels obliged to keep pushing more and more over to your side of the dish. Did I mention you are all eating out of the same dish? Do pace yourself. You might stuff yourself with the traditional first course, Chicken Tajine with lemon. You finally stop eating, and your host removes the dish. Only to bring in the traditional second course, Beef with Prunes. Uh-oh. You’ve pulled an American, and now you’ll have to just keep eating. Which is not such a bad thing. But try to ask the person who you’re most familiar with early on in the meal if this is all there is. They won’t mind. 7. Do stop when you’re full. Of course your host will keep saying “kool, kool”, eat, eat. That is just what good hosts do. Believe me you are not offending anyone if you stop eating when you’re full. If your host says “kool” and you hesitate for just one second, then she will think that you are just stopping to be polite. Once you make the call, make it final. I usually say “I’m not being shy, I swear I’m full, alhamdulillah”. And that works for me. Don’t be lazy. When the meal’s over, at least offer to help clear the table. Of course they won’t let you, but don’t let them train you to be lazy. Learn from what they do, not what they say. When I am invited, my Moroccan hosts are usually so competent that I just watch in amazement how they pull the whole thing off. Usually, it’s because there is a strong team of people working together. It’s rarely just one person doing all the work. That’s my list. Did I miss any? By the way, I had to google “do’s and don’ts” spelling. I went for the easier to read version, whereas the more grammatical form is “dos and don’ts”. No apostrophe “s” for plural. I never knew. But while you’re waiting (for me to redeem myself), let’s do something useful together. Let’s have an (extremely short, I promise) lesson in Darija. And what is Darija you might be wondering? Well it’s simply the Moroccan dialect of Arabic. It’s Arabic, minus any vowels, mangled beyond recognition, un-writable, fun, changing, current, loving, formulaic and spiritual (I say all that in the most affectionate way possible). After all, it’s my second native language, along with English. And what you should say, when in Morocco, is besseha (alternately, in text message darija “bss7a”, yes, 7 looks like the Arabic letter “ha”, a deep guttural “h”, but sorry, I can’t help you more than that with pronunciation via this blog, I just don’t see how that would be possible). This simple word conveys a multitude of meanings. A literal translation gives us “with health”, something like “to your good health”, or “wear it in good health”. It means “I’m happy for you” , “congratulations”, “good for you” and “you deserve it”. It also has a deeper level of meaning. In Morocco, where people just don’t have a lot, well, envy can certainly arise. When you see someone (say your best friend) with something newly acquired, whether a new haircut or a newly re-decorated living room, what is your FIRST inward reaction? Is it pure happiness for that person? Or do you feel a slight pinch? Do you immediately wonder how you can get the same? Or does envy bubble and boil, like salt eating up a snail? Does your inward reaction match your outward reaction? Do you want your friend to have a life as good as yours? Or even better? Well, maybe it’s a little of everything. But for me, a true and pure happiness for others is a goal, perhaps a lifelong goal. When I find people with this quality, I inhale really deeply, maybe I can soak up some of their kindness and sincerity. From what I’ve observed in Morocco, and in my own self, is that saying a word like “besseha” can put out the fire in my heart very quickly. Maybe pure happiness for others’ blessings is not your/my first instinct, but maybe we can train our hearts to do this. Saying besseha, to me, is like saying “I purify my heart from envy for your blessing”. It’s like stomping on the fires even as they are lighting. I say it as much for my own benefit as for my friend’s. Words are so inadequate, and yet they’re what we have, and they are a miracle. They are like small stones that we give and receive from each other…some are common pebbles, some are semi-precious, and others are rare gemstones. “Besseha” is somewhere in there, in the mix, a discreet little gem, not the most magnificent, but a good token to exchange often and freely. And the response to it is: Allah ya’teek sahha, which means: “may God give you health”. An equally expansive and magnanimous expression, one which does not focus on oneself, or even the blessing, but rather on the Source of the blessing. Much love from Marrakesh, and “besseha” on your latest blessing, whatever it may be!